FAQ's about our 2017 Package Deals. How many people go to the Annual Sturgis Motorcycle Rally each year. Ticket and Info about Sturgis Rally concerts, tickets. 1. What type of people book this tour? All types! We encourage riders, non-riders, first timers, fun seekers, world travelers, the young, the young at heart - to join us on tour. This tour is for the traveler that wants to make the most out of their trip to Sturgis, to cover all the bases and not miss a thing! We carefully plan our packages to help you maximize your Sturgis Rally adventure, including everything you could want to see and do while in Sturgis for the Rally, but also leaving plenty of free time to explore the Rally on your own. Our itinerary leaves the mornings free for our riders to take advantage of the many scenic rides and day trips that are within short distance from Sturgis and Deadwood. For our non-riders, mornings offer an opportunity to catch a tour to Mount Rushmore, to explore the vendor villages, to wander through the many motorcycle exhibits, etc. One of our favorite pastimes is relaxing on the deck of one of the many downtown bars and watching the parade of beautiful custom bikes go by while sipping a cold beer. This is truly a sight to behold! In your downtime when no events are scheduled, you can count on our guides to point you in the right direction for tips and advice on where to go, what to do, what events are happening and how to get there. 2. How many people come to the Rally each year? 3. How do I get to the Sturgis Rally? You can ride in, you can fly in, you can drive in! Check out full details on our Getting to Sturgis page HERE. Many Rally guests ride in from their home town, some traveling great distances to arrive at Sturgis. We meet bikers each year that ride in from Coast to Coast here in the US, as well as Canada and Mexico. Sturgis is an international destination, too - many Europeans and Australians make the trip - the Annual Sturgis Motorcycle Rally is the "Rally of all Rallies" for the true motorcycle fan. 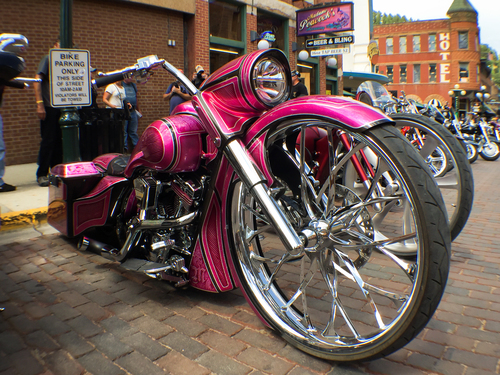 However you get to Sturgis, the trip is always worth it! 4. Where can I rent a motorcycle? If you are flying in, you can either rent a car and drive into Sturgis, or you can rent a motorcycle and ride in. You can also rent a motorcycle in Sturgis for the week, or even just a day or two if you'd like to get a nice ride in to Mount Rushmore, for example. For more information about renting a motorcycle, visit our Rent a Motorcycle page HERE. 5. So what's up with all the Campgrounds? We are sure you've heard a thing or two about the Sturgis Campgrounds. That they are wild and crazy, and that anything goes. For some campgrounds, this is true! The Campgrounds in and around Sturgis host thousands of Rally-goers, and serve many purposes. First and foremost, you can call a campground home for the week if you purchase a camping pass. Camping includes private RV's, RV rentals and tents. Many riders bring their tents on their backs and set up upon arrival. Others enjoy more of a "Glamping" lifestyle, which is glam-camping, in beautiful huge RV's custom detailed to match their bikes. Secondly, the campgrounds feature bars, restaurants and live entertainment and concerts - for example, Buffalo Chip will feature Kid Rock, Miranda Lambert and Weird Al Yankovich in their 2016 lineup. If you have purchased a camping pass and are staying at the campground for the week, this gets you free admission to all the musical acts. The campgrounds also sell tickets to people staying in other campgrounds and hotels (see below for details). 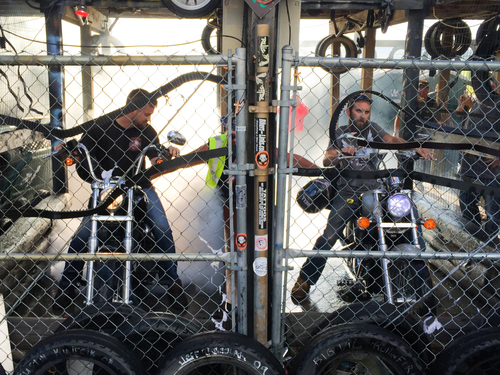 Thirdly, the campgrounds provide a fun and unique "social opportunity" to meet bikers from around the world, to watch or partake in all kinds of Rally shenanigans, like wet T-shirt contests, body painting competitions, swimsuit competitions, etc. etc. Each of our packages includes a week-long Shuttle Pass between Deadwood, Sturgis and the Campgrounds, so you can check out the camps during your stay! 6. Where can I get Rally concert info and purchase tickets? NOTE: It is not uncommon for bands to be booked late in the season and very close to the Rally. What's in our 2016 Packages? Copyright © 2018 Festival Insider Tours. All Rights Reserved.